In the end, instead of climbing back up the slippery bank I decided to carry on a little further. This may well have been another procrastination device to avoid the muddy ascent but it proved to be more interesting than I expected. Of course, I’ve walked this way many times but, even on a familiar walk, there can be surprise discoveries. 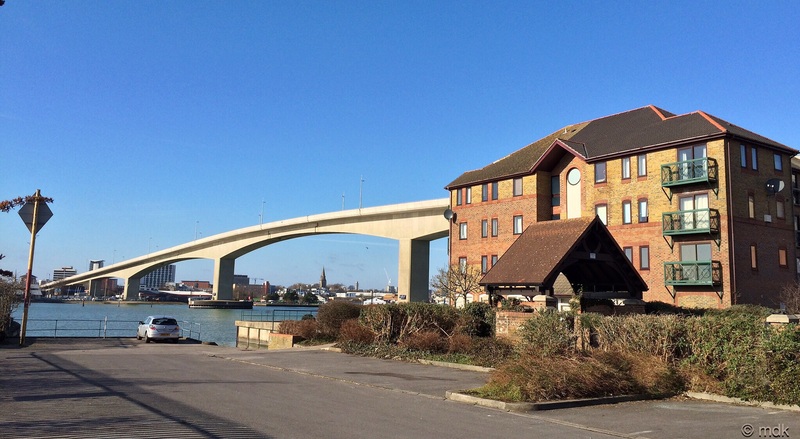 Passing the Yacht Pub where people were enjoying a Sunday lunch time drink in the winter sun, I made towards the slipway and the little park where the Itchen ferry boats used to come and go. 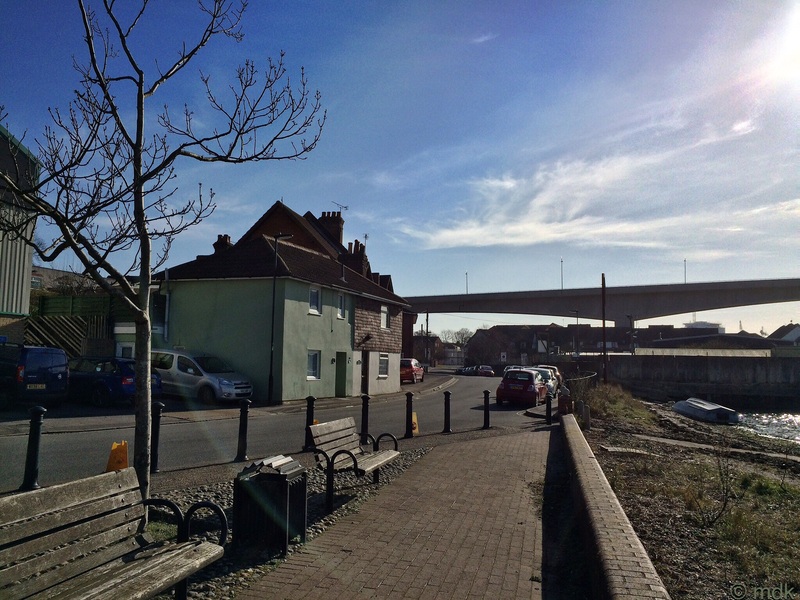 Nestled next to the shipyard and the industrial units of Hazel Road it’s a pretty place to sit and I’ve stopped there for a snack or a drink on many long walks. 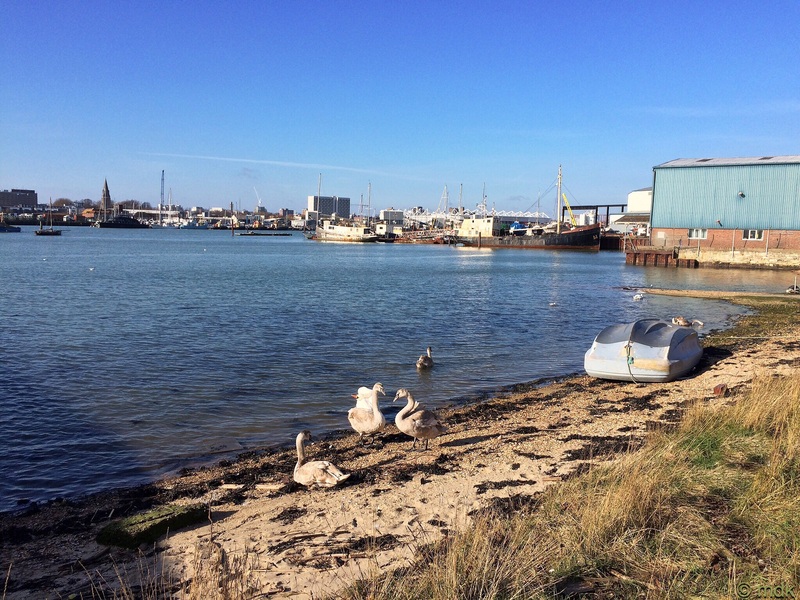 There were swans on the little bit of shingle shore, a little blue boat upside down and, on the slipway, a trailer. 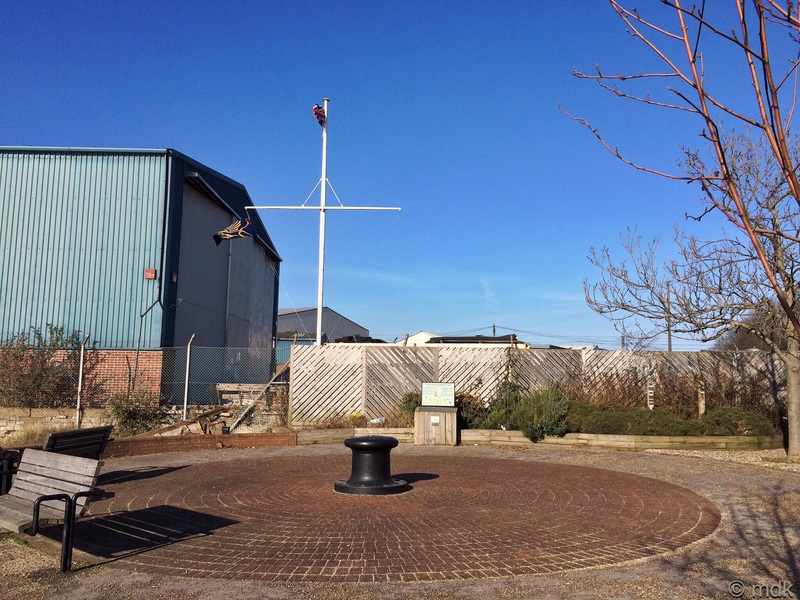 The circular block paved garden has a mooring bollard as a centrepiece and there are plenty of benches to sit on. 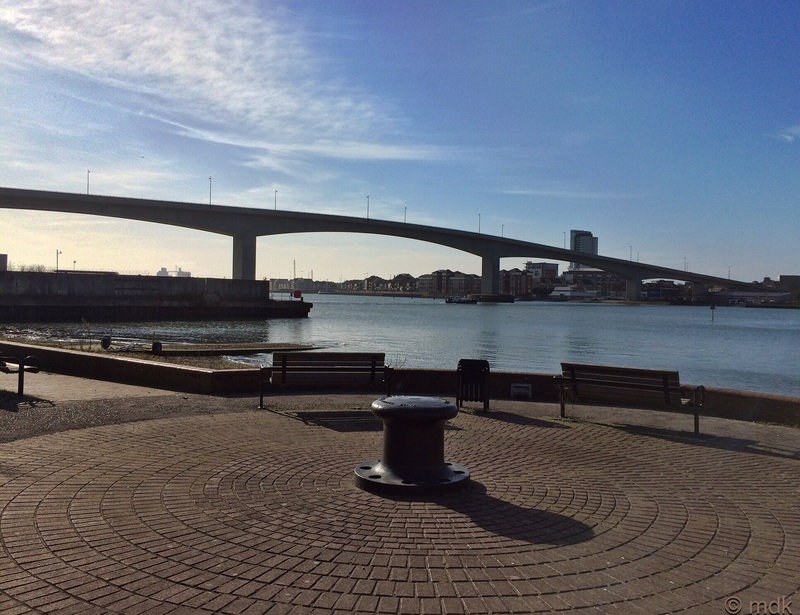 It always struck me as ironic that the Commemorative garden is overshadowed by the modern Itchen Bridge and, without it, the Floating Bidge slipway would be visible. 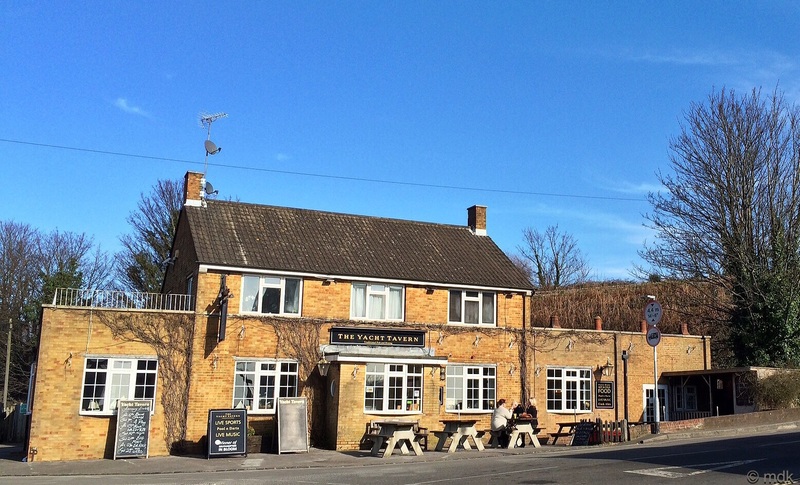 Of course, I’d always known about the ferry boats and the small community of Itchen Ferry Village living on the ribbon of land by the water but I’d thought these were the things that led to the disappearance of the village. 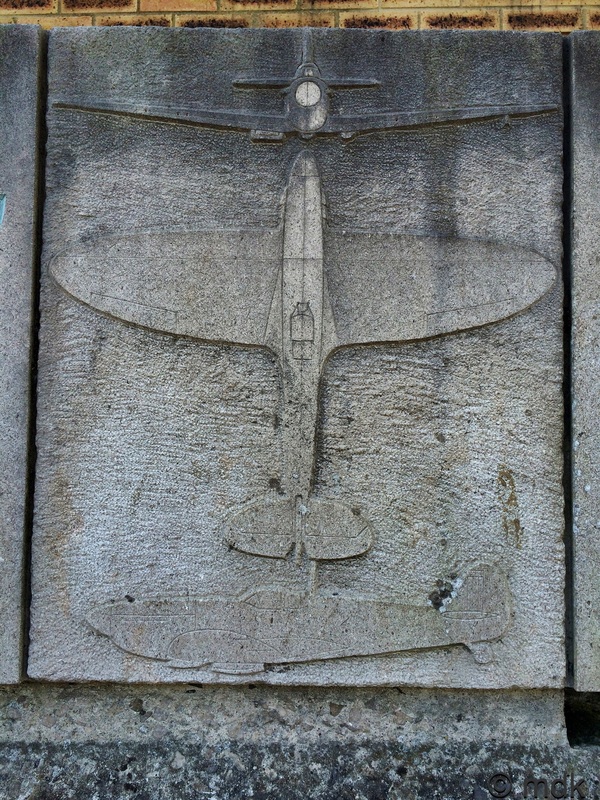 Searching for information about the Supermarine Factory and the air raid shelter I found out a lot about the village. For a start, it was far older than I thought, dating back to a tribe called Icene who settled on the eastern bank of the river and, eventually, gave their name to both river and village. The inhabitants were almost all fishermen or ferrymen and they had an important role in the wider community. During the French raids of 1338 they carried the people of Hamtun over the river to safety and did the same in the 1600’s when the plague came to the town. Ferrying was not the only way they made their money though, almost everyone in the village was also involved in smuggling which may have been why they gained the reputation of being a little odd and insular with a deep suspicion of strangers. In the nineteenth century when the railway and the Floating Bridge came to town, rather than leading to the demise of the village, it actually saw it grow. Streets of small two up two down houses were built on winding gravel lanes and those lucky enough to have a small garden kept chickens and grew vegetables. At first the villagers objected to the new method of crossing the river but, after a petition, they were granted free passage on the new bridge and I imagine their smuggling and work in these new industries put food on the table. 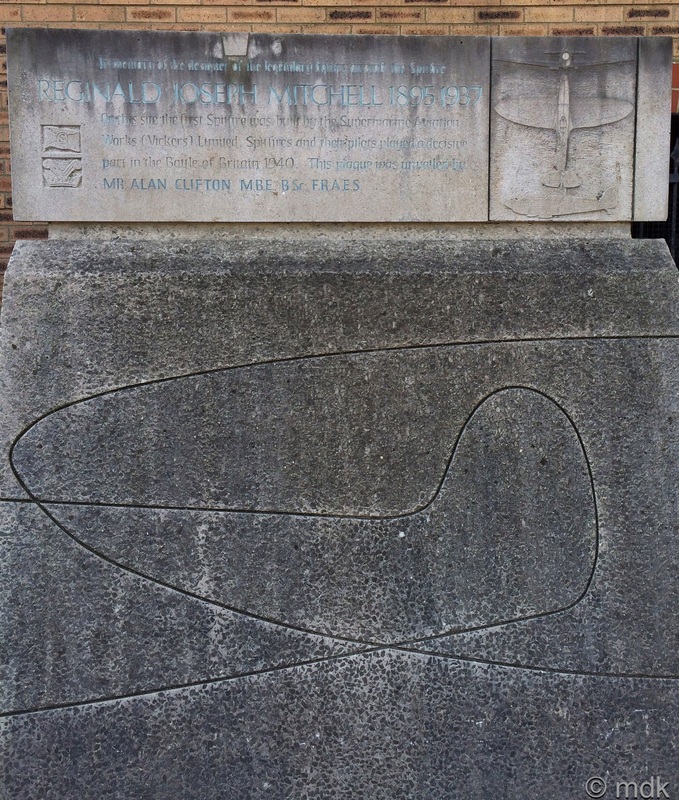 The real reason the village was lost were the bombing raids on the Supermarine factory. So little was left it was impossible to rebuild and the village disappeared forever. 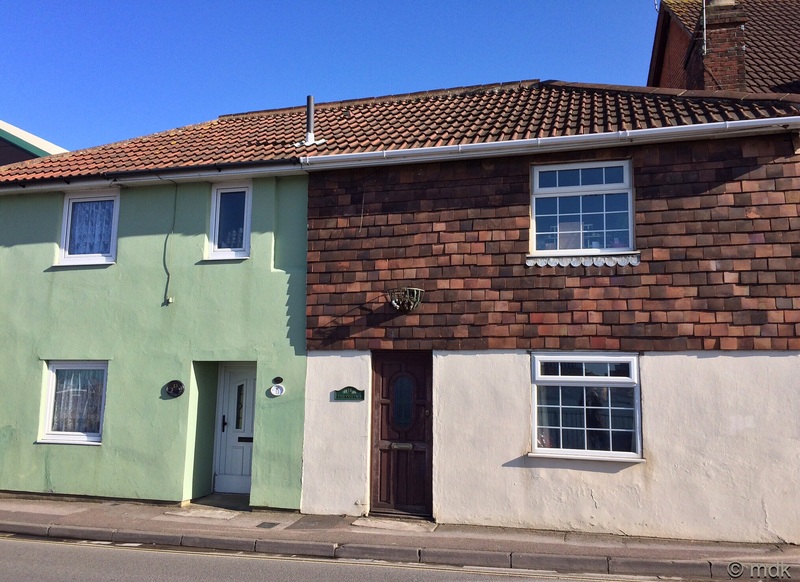 Just two cottages remain, now absorbed by Woolston. How many times have I passed them by without realising their importance? After the bombing the ruins were used for training troops in preparation for the Invasion of Europe, which may explain the troops camped on the green. 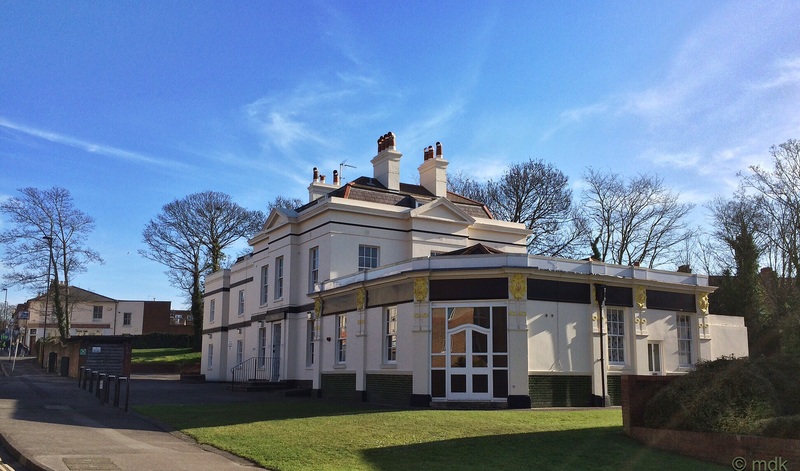 The only remaining pictures of the houses are as a background to the huge Supermarine factory that dominated the shoreline. 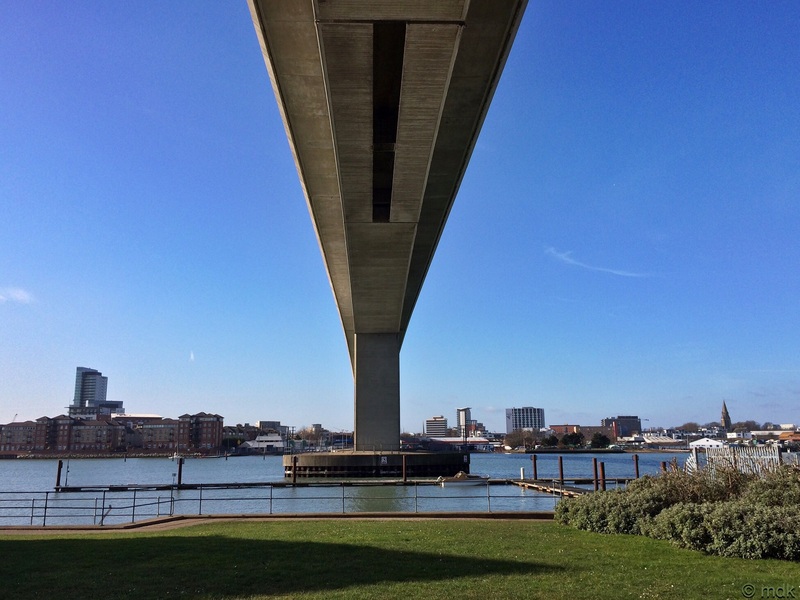 The modern development under the Itchen Bridge was built on the spot where it stood and, as I was so close, I thought I’d walk a little further and find the blue plaque Commando Junior had told me about. 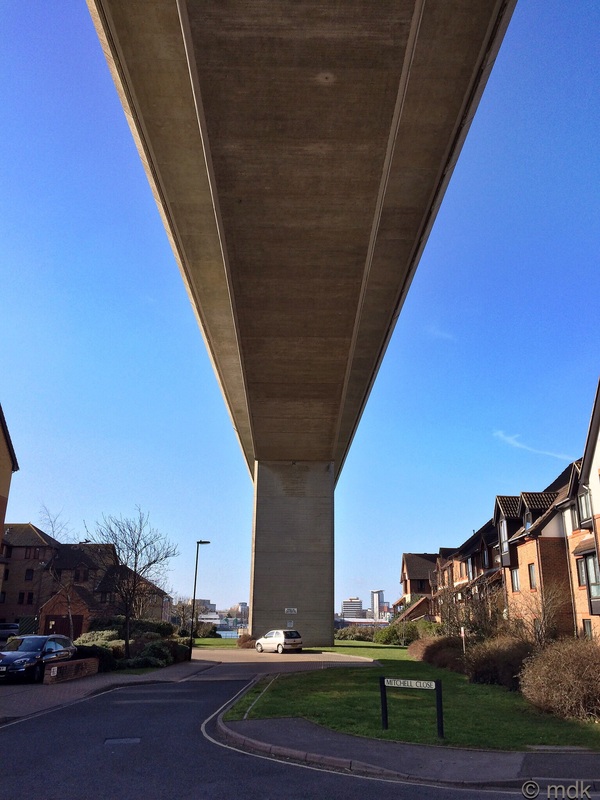 Under the gigantic concrete span of the bridge I looked out at the houses of Mitchell Close, named after Spitfire designer R J Mitchell as I’ve done many times before. This time though, instead of walking up towards Woolston, I headed for the water. Here I got a view of the bridge piers, something you never notice from high up on the bridge. I also noticed a little gate to my right and it seemed to be open. How could I resist? 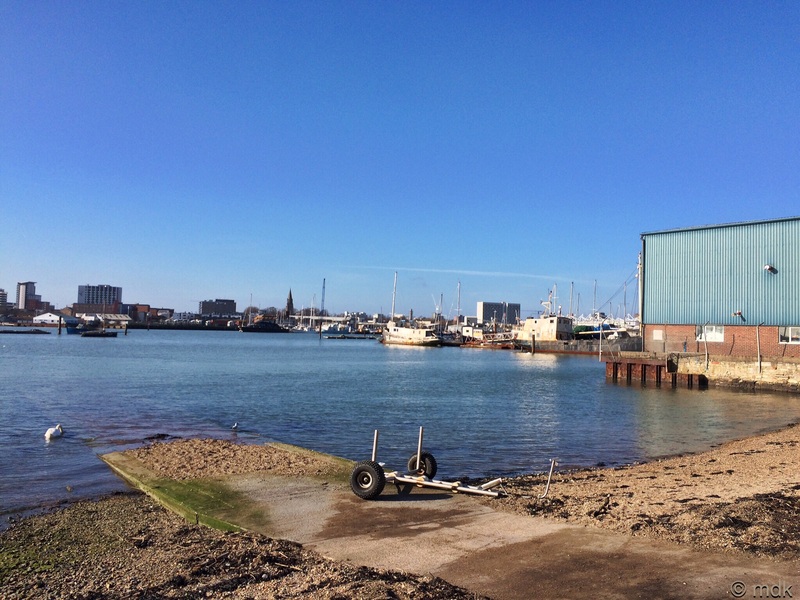 Through the gate was the famous Supermarine slipway where the first flying boats, forerunners of the Spitfire, were launched. 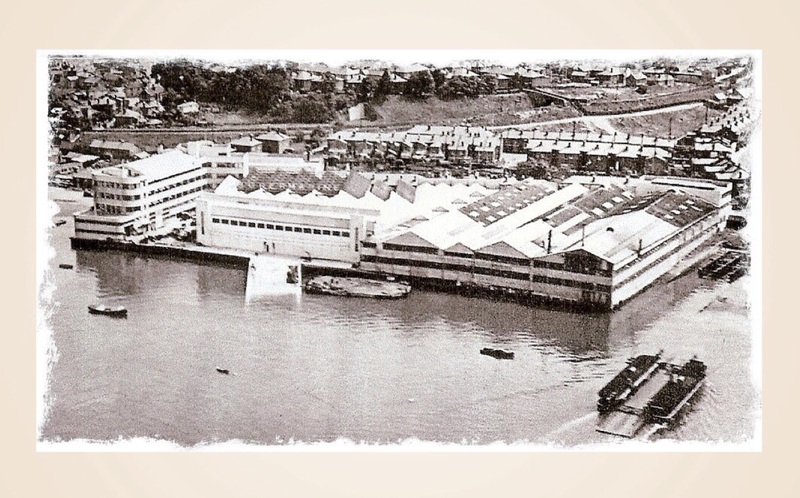 As I stood at the top of that famous slipway looking out across the water I felt a huge pride for my heritage and the brave men and women of this city who worked in the Supermarine factory while the bombs dropped all around them. Between running marathons, Commando builds aircraft for a living, in another time he might have been building Spitfires and running to the shelter under the railway arch when the sirens wailed. Of course, I also got a different perspective on the bridge. 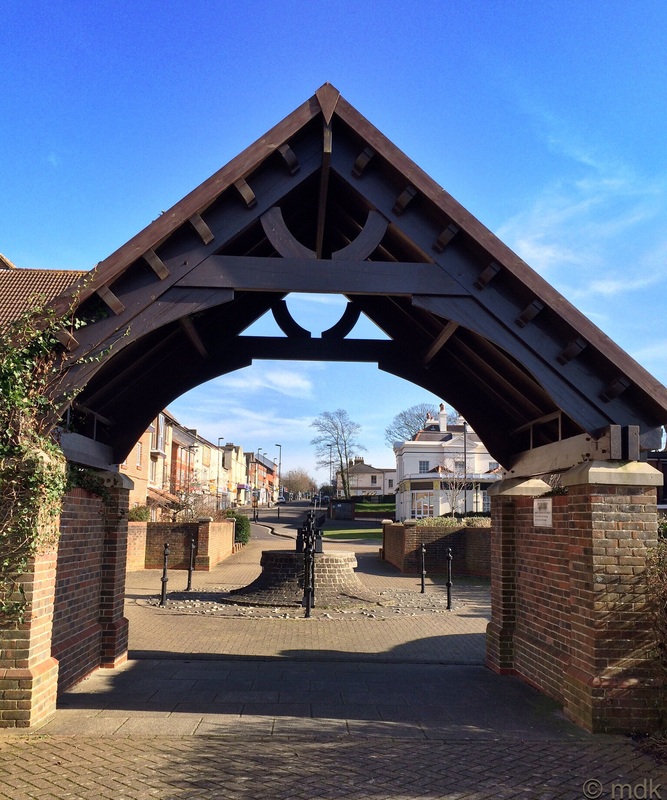 As I still hadn’t found the blue plaque I walked back along the river path towards Woolston. It didn’t take long to find it, right in front of the entrance to Spitfire Court on the edge of the river. I’ve never thought I’d like to live in the houses under the shadow of the bridge with cars whizzing overhead and people jumping off every so often. 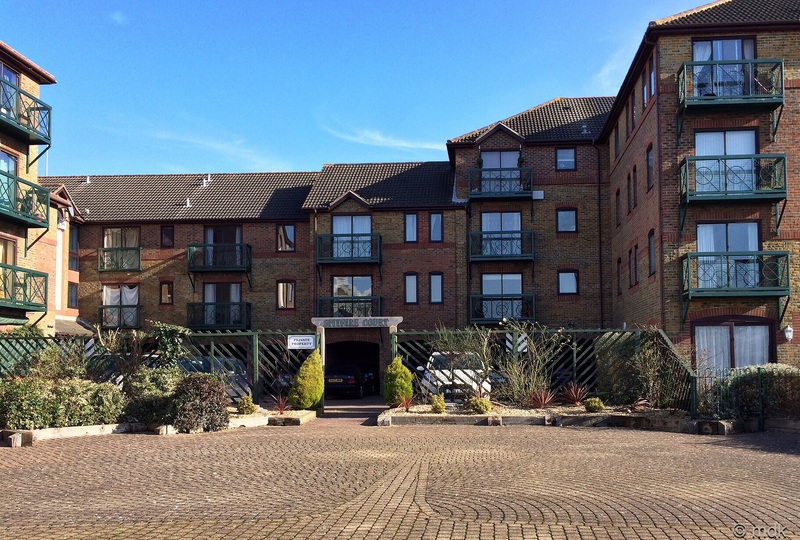 Seeing those lovely flats With balconies looking out across the river almost made me rethink. With one last look back at the bridge I turned and made my way towards the remains of another bridge, feeling I might as well go for all three while I was there. After the Itchen ferry boats and before the Itchen Bridge there was the floating bridge, a large barge running on chains across the river. The first one arrived in 1836. It was made of wood and steam powered the workings on the bridge that pulled the chains. For the first time vehicles could cross the water without travelling all the way to Northam. Like the ferry boats, there was a price to pay, sixpence at the start, and it took four minutes to cross. The problem was it could only carry sixteen at a time. 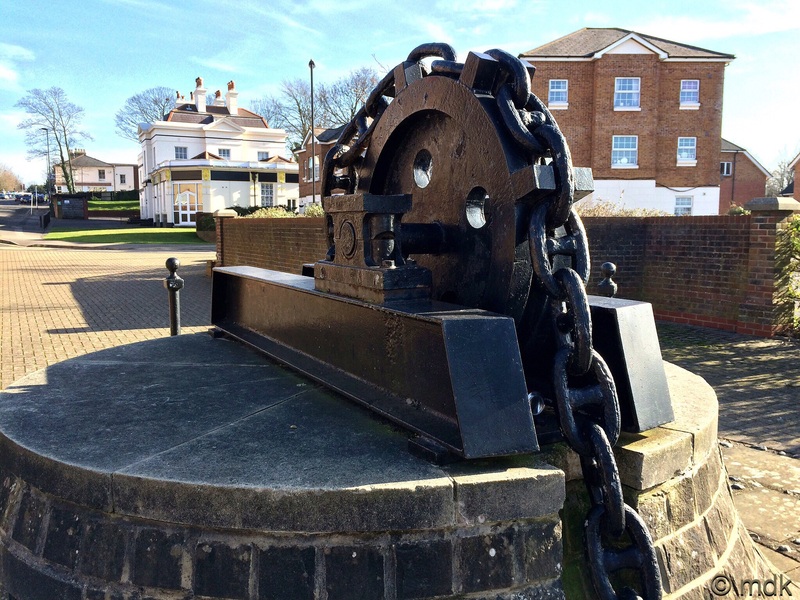 In 1890 a second ferry was added, iron this time, along with a second set of chains so the two could go back and forth independently. It was also safer than the ferry boats But there were accidents. In the early 1900’s a dray horse panicked and bolted into the river taking the drayman to his death. One floating bridge was hit by a tug and sank, everyone survived but the bridge was lost. 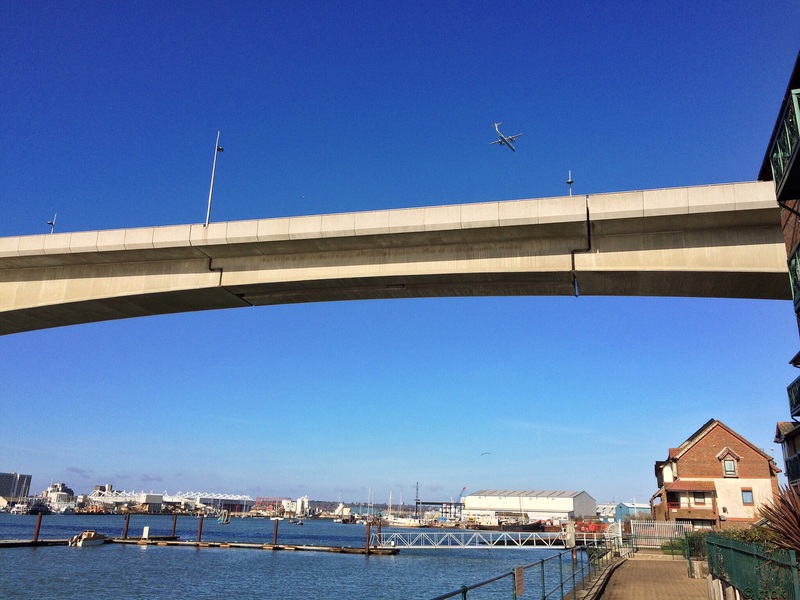 The people of Southampton have fond memories of the old floating bridges. In my youth foot passengers were free and Commando, who was brought up in the area, would go back and forth just for the fun of it. Coming from further afield and with Northam Bridge on my doorstep a trip across the bridge was a rare treat for me. 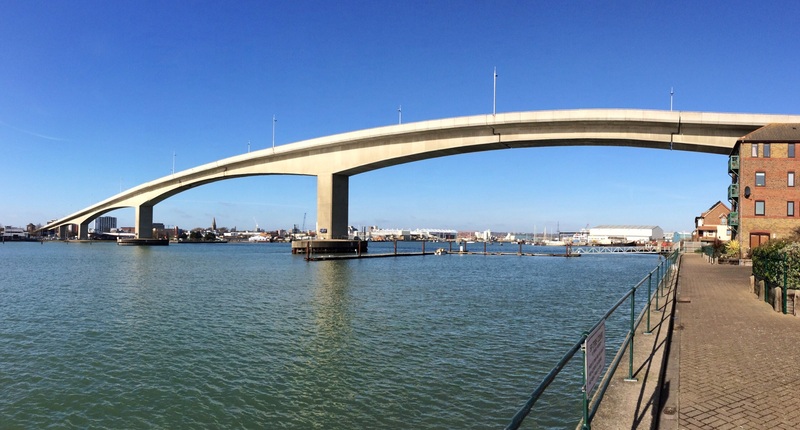 While the new road bridge is undoubtedly better in terms of getting a large volume of traffic across the Itchen, I think we all wish we could have the floating bridges as well. 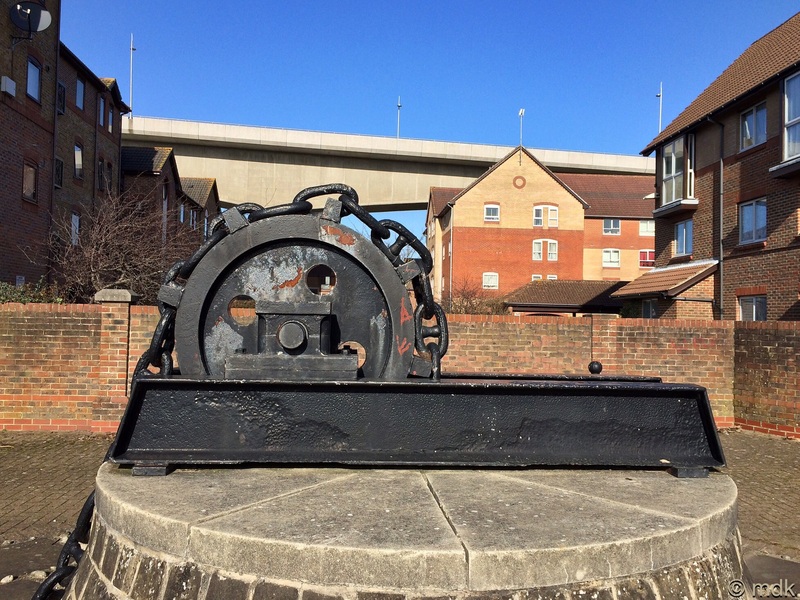 Now all we have left is a slipway, the huge wheel that held the chains and a stretch of the gigantic chain itself. Still there is a pretty gateway to walk under to look at it. So I walked past the old Cliff Hotel, now fancy apartments, towards the bridge. 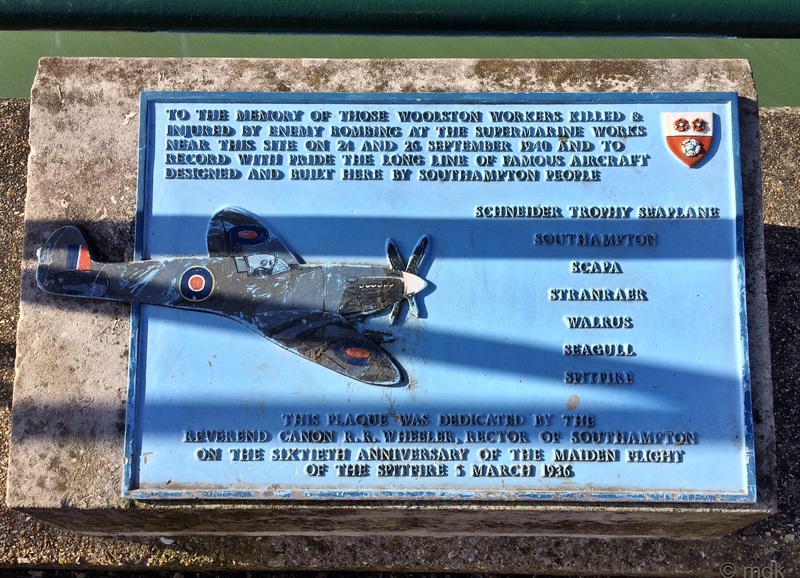 With a short stop to take a picture of the Spitfire plaque I’d seen before I carried on past the cottages of Itchen Ferry to the green. There was one more thing I wanted to see. 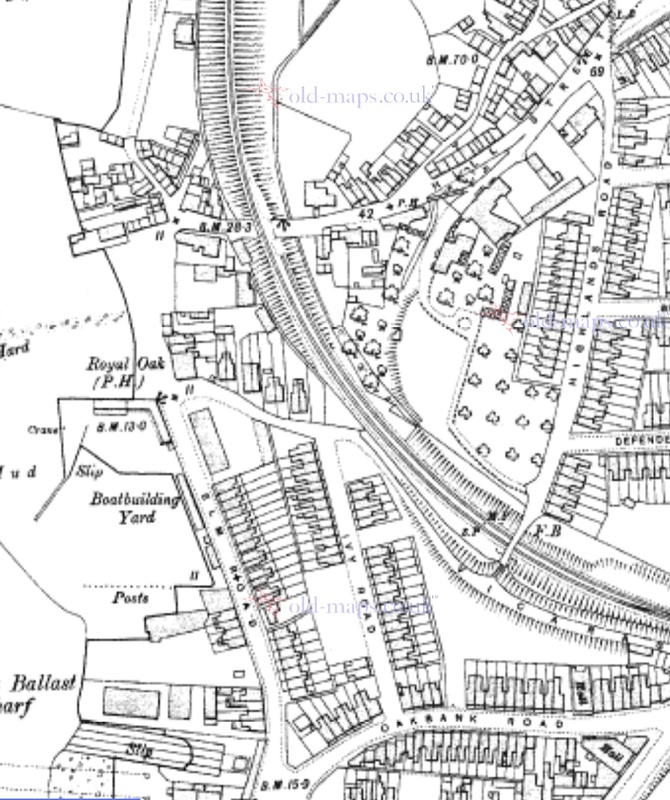 When I’d looked at the old maps I noticed the old pear tree was such a feature it was even marked. 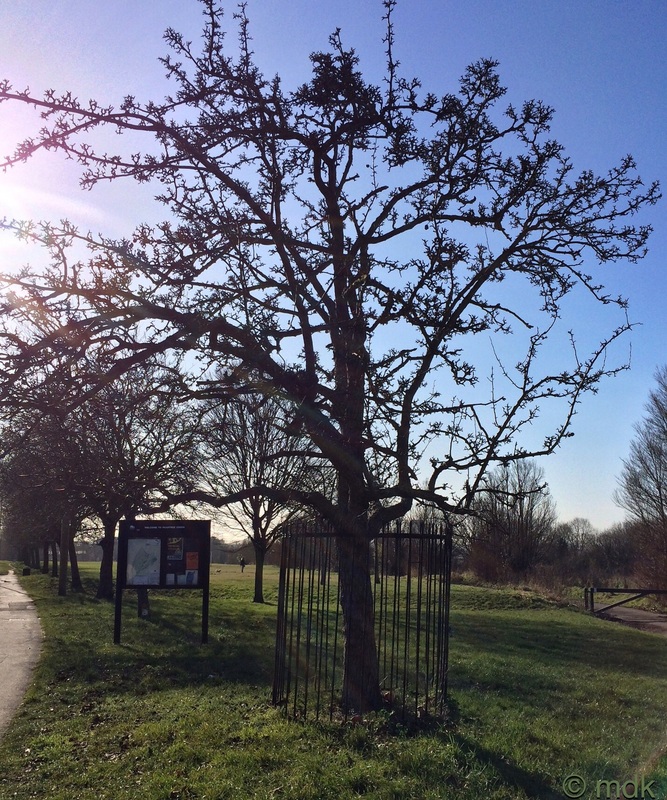 In the past I’ve often wondered where the pear tree stood, now I knew I wanted to see if there was anything left at all to mark the spot. With some difficulty I clambered back up the steep bank to Peartree Green and, to round the circle, took the path closest to Sea Road. Here I found a rectangular area covered with what looked like broken concrete that gave yet more credence to the story of troops camped here. It had certainly once been a building of some kind. Some young lads came racing towards me along the muddy trail. They were laughing and soon another lad came chasing after them. “Are you it?” One of the boys called out. “No,” the straggler shouted back. “If you are and you tag us it won’t count,” the third boy yelled and they all ran off towards the slope. I stood for a moment smiling and thinking of a young Commando playing similar games on the green. Some things never change I suppose. When I walked on I was still smiling to myself, even as I climbed the last slope out of the grassy basin and made my way up to the top of the green. I probably looked slightly mad grinning away to myself but it wouldn’t be the first time and it probably won’t be the last. The people of Southampton are probably used to it by now. There was a quick stop for a couple of photos of Peartree Church from across the road. As I’ve written about the church before I won’t waffle on too much now. From there I made my way to the apex of the green where the top of Sea Road and Peartree Avenue join. This was where the miraculous pear tree once stood. Of course I didn’t really expect to see anything left of the tree except maybe a ragged stump. Even that would be pretty miraculous after so many centuries but I wanted to see the spot now I knew where it was. 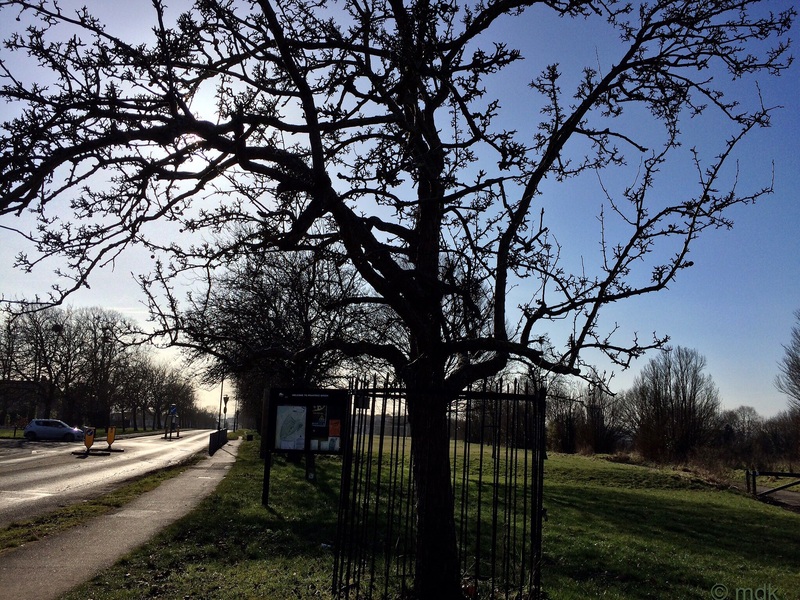 Just past the post that tells everyone they’re on Peartree Green, in case they didn’t know, I noticed one tree with an iron fence around it. It seemed to be standing in the spot the map said the old tree had stood but the tree was obviously not particularly ancient and had certainly not been struck by lightning as far as I could tell. When I went for a closer look I saw a small brass plaque. 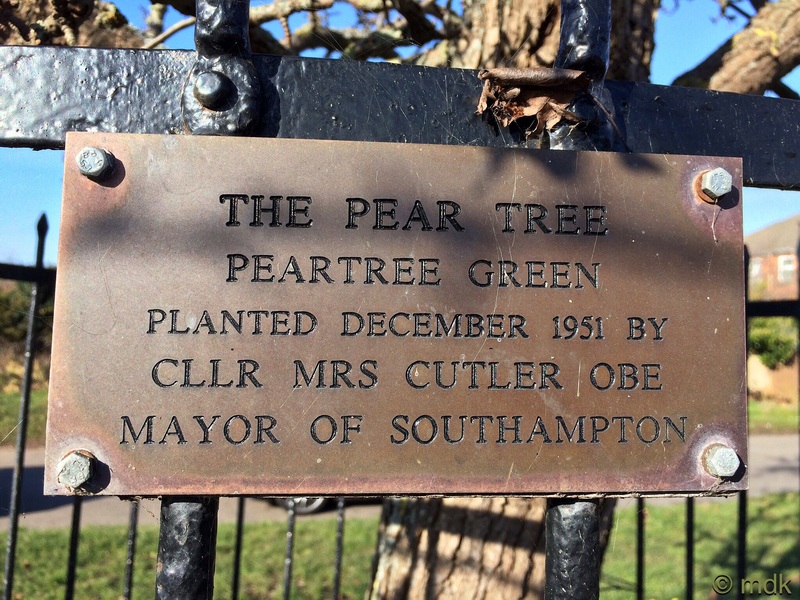 This told me it was actually a pear tree but one planted in 1951 by the then mayor, Councillor Mrs Cutler. 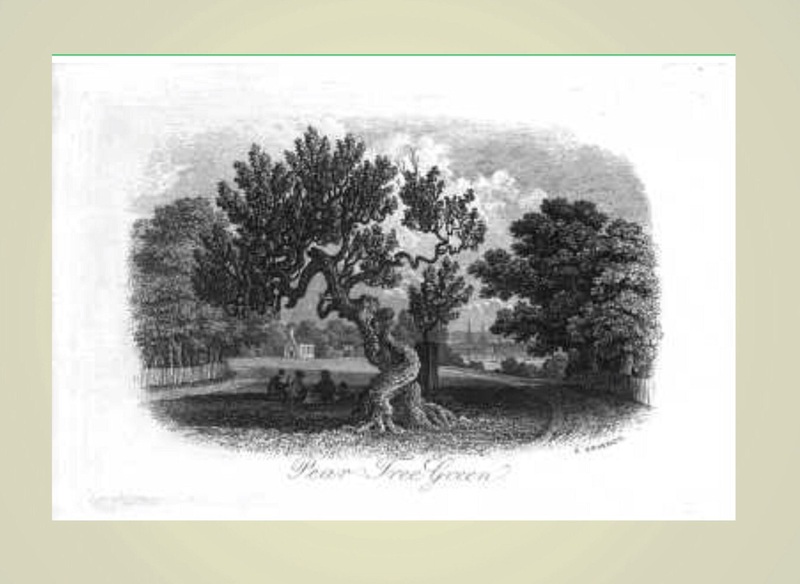 It was nice to know there really is a pear tree on Peartree Green but I can’t help wondering how I’ve passed right by it so many times without noticing it before. I would have loved to travel on that ferry, chain ferries are my idea of fun! Thanks for all the related pictures. It was a real treat to go on the Floating Bridge. Many people miss it. Oops! Sorry, had a senior moment mixing up floating bridges and chain ferries. I have never set foot on a floating bridge, what fun! I’m glad you enjoyed it. 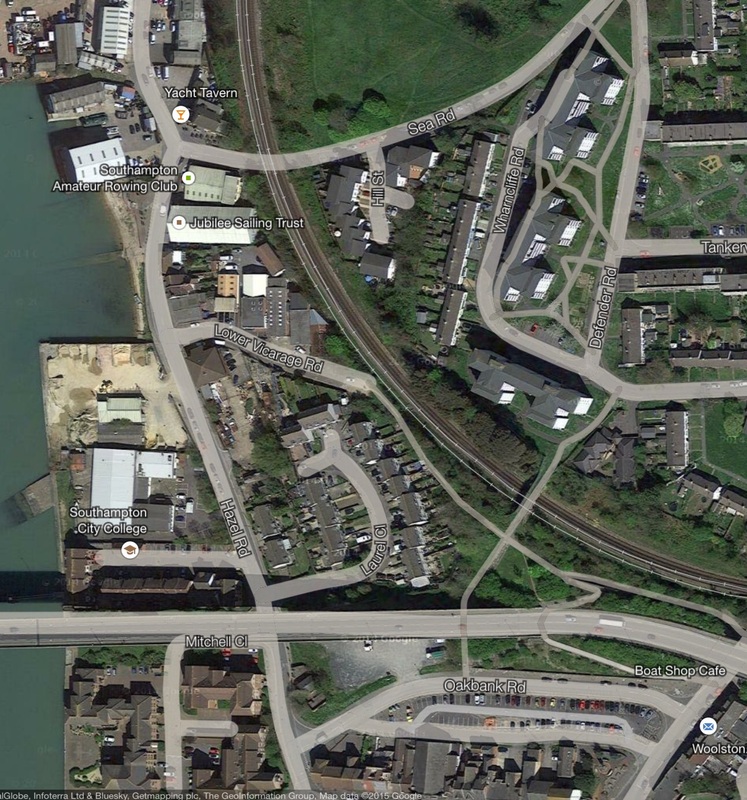 The research was very interesting and taught me a lot about Itchen Ferry Village that I’d not known before. One of my class mates at senior school was a Diaper (Theresa) but I didn’t know the Itchen Ferry connection back then. I wish I had. I also went to Beechwood and Glenfield schools, as did my boys. At Glenfield we were told not to go into the woods surrounding the playground so, to be daring, we’d stand with one foot on the playground and one on the grass of the woodland. I wonder if the steam engine that pulled those chains is underground there. You should visit that pear tree in the fall and see if there are any pears on it. Ripe pears right off the tree are delicious! I think the engine was actually on the floating bridges from what I have read. They used one as a night club for a while but it caught fire. Now I know where the pear tree is I shall be watching with interest. Fascinating, really enjoyed learning about where I live from you! 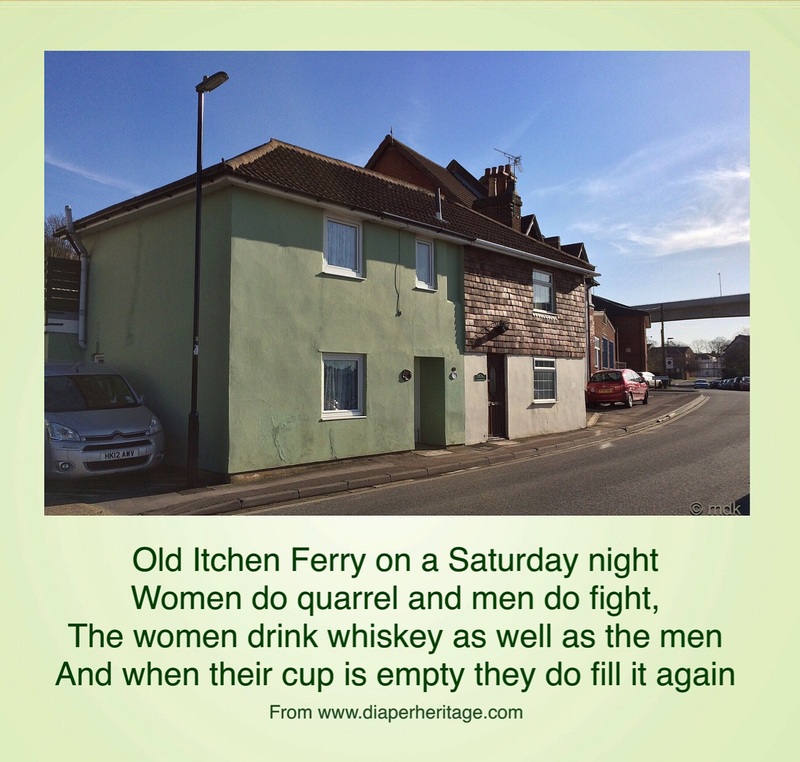 I don’t know if I can add images here, but I have tried to do a ‘then and now’ of Itchen ferry before the Blitz, and now. It was quite built up around the bottom of Sea Road! I’m a graphic designer by trade, so it was all done with the wonders of google and photoshop! Feel free to use any, I’d be flattered. They do help visualize the area your post covers quite well. You are obviously far more gifted than I am. They are works of art. Thanks James. It’s always interesting to find out more about my home town. You’re right too, it is surprising there was anything left after the war. What a fascinating walk Marie. Being able to recognise signs of former times make the landscape so much more interesting. Very true. The stories on the facebook page and the old maps really helped me learn more. Love the idea of the floating bridge and that there are still parts to keep the story alive! 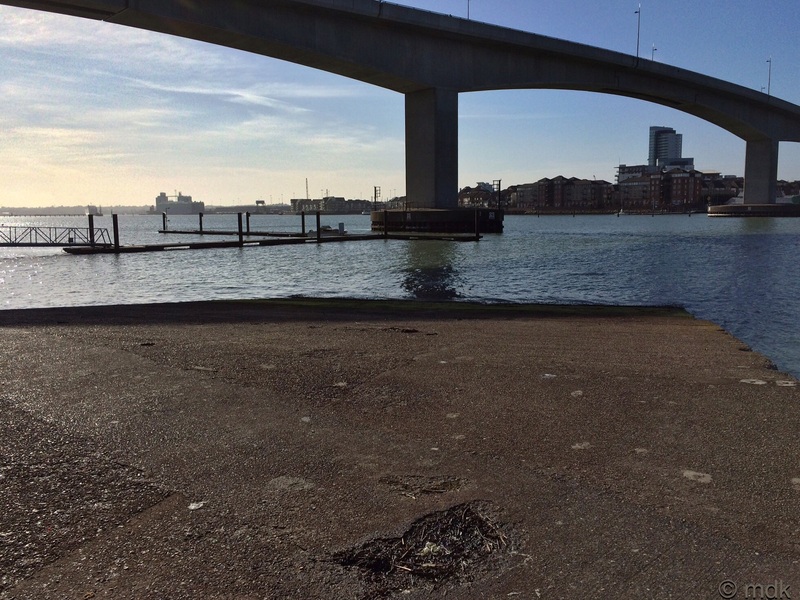 The floating bridge is a very fond memory for the people of Southampton old enough to remember it. For the young ones it has become a bit of a legend. 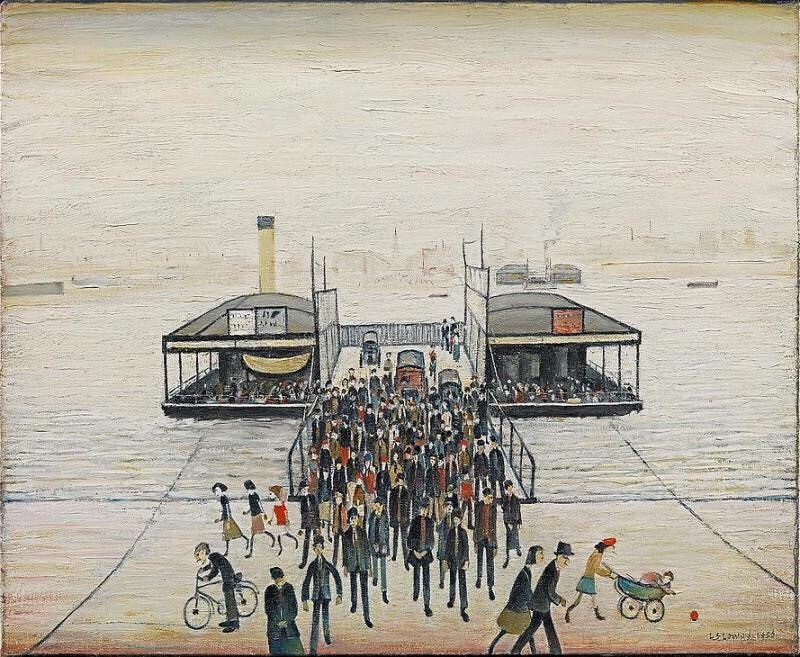 Lowry’s painting has pride of place in our art gallery. We have an ornamental pear. It is my favorite tree. (My second favorite was a tree I used to climb in my grandmother’s yard back in Oklahoma.) We planted the tree when the children were little, and it now covers most of our front yard with shade. In the spring it has the prettiest and most fragrant blossoms in the neighborhood. I enjoyed “walking” with you. I was especially fascinated by the floating bridges. I’m looking forward to the blossom this year. Im glad you liked the post Paula. Thank you Ron. I’m so glad you enjoyed it and it brought back some good memories. My husband was born and brought up in Woolston/Itchen and this was his playground too. I am always fascinated by the contrast of modern architecture with that of the past. I found it odd seeing that bridge in the midst of all that beautiful history. The New Bridge wasn’t always popular with the people of Woolston as many people were very fond of the old floating bridges. It’s certainly not as much fun but it does make a big difference to the journey from the east of the city to the west and it can look beautiful in the right light. Really enjoyed this walk with you Marie…my family on mum’s side were Diapers, so fishing and sailing were strong topics of adult conversation among my parents and grandparents in Merryoak (we lived with them until 1955 after they were bombed out of their house in the ferry village) then moved to the then newly built Millbrook estate. I have very fond memories of my Merryoak childhood and have followed the Diaper heritage group for a few years now but apart from a visit to Peartree church felt no real reason to visit an area that had such sad memories for mum and dad, despite working around the area as an apprentice electrician in the 60’s and a spell at Thorneycrofts, where as far I can make out virtually every member of my family worked at some time or another. I could talk for hours about the family but don’t want to be boring so I shall just say that this walk has given me pause for thought and I shall be going plaque hunting soon, so thank you for the inspiration, Regards Lee Barfoot. I enjoyed this very much, my Dads family the Coopers are from the village and while I have never been to England this gives me greater insight into the family history. I’m glad to have given you a little virtual tour Glen. It’s an interesting place full of real characters. I love those little houses on the green, you were so lucky to live there. Thank you for letting me know about the baseball court. I knew there were troops stationed there in the war and had been told there were still the remains of buildings somewhere so put two and two together. Obviously maths is not my strong point. 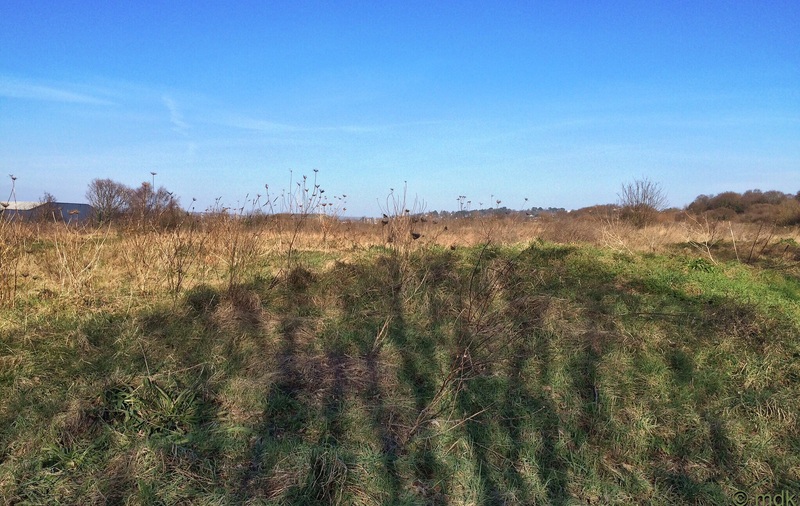 It’s a wonderful place and I hope it does get nature reserve status. It deserves it.